You likely know that Richard Andrew Sharum is a photographer who’s pretty big in Dallas – and by “pretty big” we mean that his photos are sixty feet wide, and they’re currently draped over buildings in downtown Dallas as part of Observe Dallas, the largest street photography exhibit in the city’s history. The public exhibition invites Dallas residents and visitors to interact with the public art, and in turn, to be public art. The public is encouraged to turn their cameras toward themselves, documenting their own lives and surroundings in a digital conversation #ObserveDallas2015. 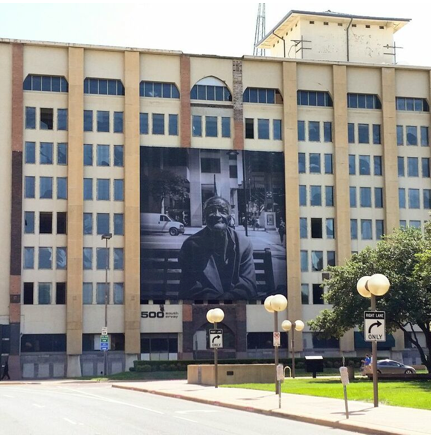 By draping eight large-scale photographs in common areas Dallas’ economic center, Observe Dallas 2015 makes a public exhibition of the lives of those less privileged. Without making any overt political statements, Sharum’s portraits feature subjects from various social strata: families, protestors, homeless people, protestors, and more. With the addition of the social dimension – viewers are invited to share their own images on social media – the project is a visual attempt to deconstruct perceived social differences, creating a semblance of solidarity. Each large-scale print will now be on display until May 31. The exhibit showcases subjects that Sharum has photographed in downtown Dallas between 2006 and 2014. The juxtaposition of homeless individuals alongside images of the downtown working class and families enjoying leisure time in Klyde Warren Park, Observe Dallas 2015 intends to portray urban life with stark realism. Sharum hopes this exhibition will encourage positive change in the community, and that the images will spur Dallas residents toward conversations about the growing homelessness situation in the Dallas metropolitan region. Observe Dallas 2015 is free and open to the public. It will be on display until Sunday, May 31.